The AHM35 and AHM45 are designed to be the most reliable 35 and 45kV testers available. They can be used for most Industrial and Substation testing including insulation resistance, dielectric absorption, DC hipot and polarization index tests. Units can be operated off of 120V AC or 12V DC with the optional inverter and a light, easily portable design makes no job site too remote. The capacitive discharge system is the most universally accepted way to locate underground cable faults. It is still the only system that works reliably on shielded cable such as URD type concentric neutral cable. 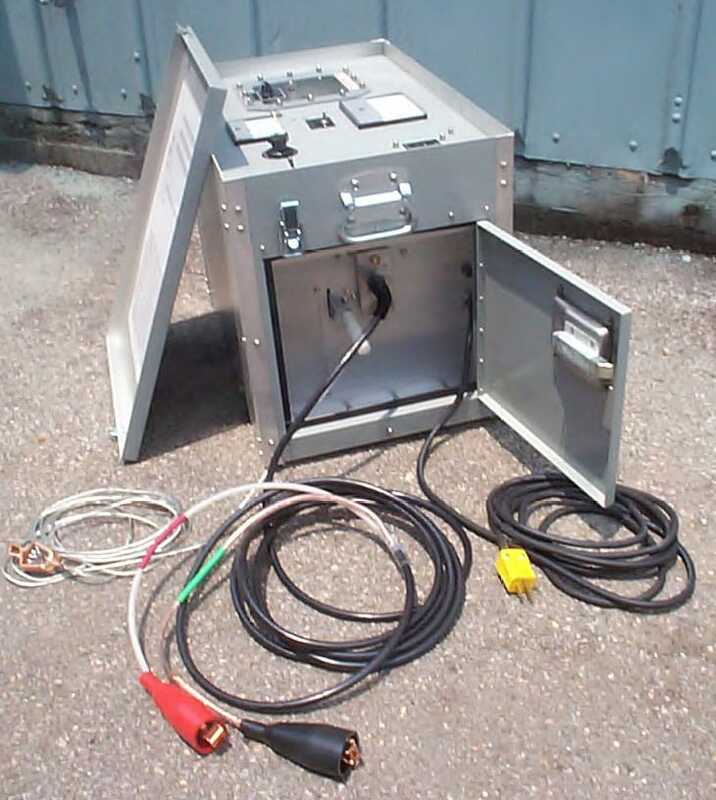 The basic capacitor discharge system consists of a capacitor, a high voltage D.C. power supply, and a means of connecting and disconnecting the capacitor to the center conductor of the faulted cable such as an impulse control gap. These components are shown in the simplified diagram below. The fault is shown as a gap. This is an accurate description of faults on URD type cable since a fault is a hole or cut in the insulation between the center conductor and the grounded semiconductor, shield wires and earth. The objective of the system is to dump the stored electrical energy in the impulse capacitor into the cable fault such that an audible noise or thump is made. The thump should be loud enough to be heard and felt by personnel without detectors walking above the cable. The amount of energy available at the fault to "thump" the ground or ductwork is related to the characteristics of the fault gap, the electrical impedance of the path from the discharge capacitor to the fault and back, the energy in the discharge, the voltage of the discharge, and the rise time of the discharge. A fast rise time provides maximum noise at the fault with the least energy. After each discharge, the power supply must charge the capacitor bank. The variable autotransformer on the power supply is used to adjust the rate of discharge. Amperis systems are designed for a continuous rate of discharge every six seconds at 30kv. The discharge voltage of the capacitor is related to the impulse control gap voltage and the fault gap voltage since they are in series. By adjusting the impulse control gap, the impulse capacitor can be charged to its rated voltage regardless of the characteristics of the fault gap. This allows the fault to be located with minimum energy and voltage. To locate a fault the voltage rating of the discharge capacitor must exceed the voltage rating of the fault gap. The 35kv maximum discharge voltage has proven to be sufficient for all presently installed solid dielectric distribution cable. Megohms are listed above both the 0-10 and 0-30 scales on the output current meter. To measure megohms resistance with minimum calculation, set the output voltage precisely on a value selected from the chart. Turn the output current range switch to the lowest range or until the output meter reads in the middle or the right third of its scale. Record the megohm reading just above the current scale used and multiply this by the multiplier found on the cart for megohms resistance. As a check, the minimum, center scale, and maximum resistance readings are listed for each range setting. High reliability Amperis voltage double circuit with silicon rectifiers. The fully protected output meter in the high voltage lead indicates true leakage readings. Ranges 0-10 mic, 0-30 mic, 0-100 mic, 0-300 mic, 0-1 ma, 0-3 ma, 0-10 ma. Megohm scales on the output meter allow direct resistance reading from 100,000 ohms to 300,000 megohms. A 0-5 amp A.C. ammeter in input of the 110 volt to 13kv air insulated epoxy impregnated high voltage transformer. A rugged taut band high torque kilovoltmeter wit ranges of 0-10kv, 0-35kv or 0-15kv, 0-45kv. A variable autotransformer for continuous voltage adjusment. An instantaneous input circuit breaker. Power on and off-discharge switch discharges cable through a 2.5 megohm resistor. Two ground relay systems require that the case ground, the 120 volt source ground, and the test lead ground be within 100 ohms or each other in order to operate the unit. Varistors are provided between the 120 volt input lines and the case to provide surge protection to the equipment. Shielded test lead, 20 feet (6.1M) long. Other lengths are available, such as 35, 60 and 75 feet. Optional built in inverter with 15 ft.(4.6m) battery leads permits operation from a 12 volt truck battery. A 35kv 1mfd. low inductance impulse service capacitor. A continuously adjustable impulse control gap. Separate sockets for testing and fault locating. 110-125 volts 50-400 Hz A.C.